Posted on March 17, 2013 by Hong Kong Wargamer Tagged Advanced Squad LeaderBoard Gameeffectivenessgamingimprovisationleadersleadershipmanagementmoralepeople managementresourcesright place at the right timewargameWorld War II	Comments4 Comments on Why Do I Love Advanced Squad Leader? Why Do I Love Advanced Squad Leader? 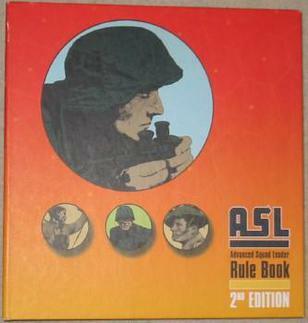 I see Advanced Squad Leader as a beautifully crafted set of rules that simulates World War 2 era combat. It puts you in the boots of squad leaders of various nationalities, locations and situations, encapsulated by the use of well designed “scenarios”, played on beautiful sets of maps. The first thing I learned from the game was that combat is certainly not about walking out into the courtyard with the biggest gun and blasting away on an endless belt of cartridges. In fact, most times it’s not even about shooting. It’s about moving. It’s about the interplay of time and space. It’s about getting into the right place at the right time. It’s about achieving your objectives with limited time and resources. It’s about looking your people, your leadership and your equipment, and figuring out how and where they can be the most effective in the given landscape. It’s about reducing your opponent’s capacity to compete, and that doesn’t necessarily mean shooting all the time. Some squads get shot at and ran but their leaders are quick to get them back into the game. Other leaders panic at the worse moment and demoralise the people they are with as well. Some leaders are great at making their people more effective, others are better off staying out of the way. Machine guns might jam and tanks might get destroyed by lucky shots. Winds might change and start to blow smoke in the other direction, making it now possible to cross the street. Reinforcements might come, concealed enemies might appear behind your lines,and that one man might run through a hail of bullets unharmed and hand-deliver a demolition pack for his enemies. This is why I love Advanced Squad Leader. This entry was posted in Basics and tagged Advanced Squad Leader, Board Game, effectiveness, gaming, improvisation, leaders, leadership, management, morale, people management, resources, right place at the right time, wargame, World War II. Bookmark the permalink.